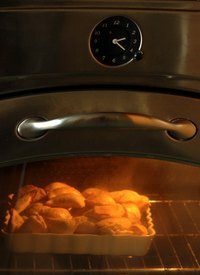 A convection oven has fans that circulate the warm air in addition to the usual radiant heat found in a traditional oven. They are commonly used commercially, but homeowners often purchase them as well. Convection ovens are often a bit smaller than a regular oven. Some ovens for home use combine a traditional oven with convection and microwave giving the cook a broad number of cooking and baking options. Frozen foods are baked in a convection oven with techniques similar to a traditional oven. Pre-heat the oven. Check the recommended baking temperature on the frozen food package and lower it 25 degrees if you are baking the item alone. A crowded oven with items on multiple racks will need the higher temperature. Place your frozen food on a medium-weight aluminum cookie sheet with low sides. A light-colored sheet works best for convection ovens as it will prevent the food from browning too fast. Check the time recommended on the package and set a timer for a few minutes less. Food cooks faster in a convection oven, especially if only one item is being baked. Place the cookie sheet with the long side parallel to the oven door. Check your food through the glass door of the convection oven rather than opening the door. Less heat will escape. Check it frequently to avoid overcooking. Special pans for convection ovens can be purchased, although any regular pan will work as well. How Long To Cook Lasagna in a Convection Oven?